Just put a dab of copper slip on the threads and spray paint the heads is what most people do. Don’t forget the point of the Porsche crest on your centre cap should point to the valve stem, and if you’re really OCD, the locking wheel bolt should be opposite the valve stem. Something to think about... perhaps not.. I believe porsche specify aluminium grease rather than copper slip. And not on the threads either. White lithium grease, but NOT on the threads - you'll over-torque otherwise. Re-painting will give a good appearance upgrade to rusty Original OE bolts. My bolts are 2 piece items, a steel bolt of 44 mm under the head length with a pressed-in-place aluminium spherical cap which goes between the steel of the bolt and the aluminium wheel. The original finish of the steel part was electro-zinc plated. On my bolts, the aluminium spherical caps were beginning to delaminate down the sides but the 2 thrust surfaces were intact. The cause of the rust on the treated steel and damage to the Ali-caps is most likely due to the effect of wheel / brake dust cleaners, many of which contain phosphoric acid. The acid will quickly remove the few microns of electro-zinc and will also rot aluminium. To refurb, remove rust from bolt head with a wire brush, preferably on an angle grinder. Mask the threads and ali-spherical cap. Etch Primer the bolt head, when dry, paint with brake caliper silver. I used Halfrauds own products. 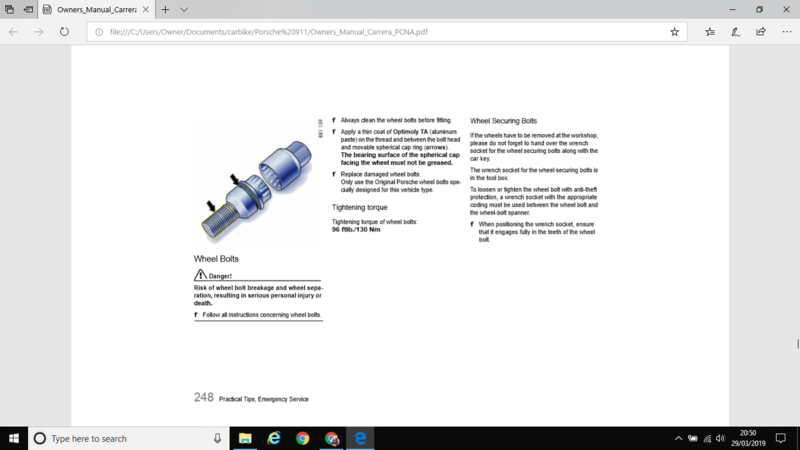 About Copaslip or Aluminium based Anti Seize, my cars handbook tells me to use Molub Alloy TA (ali based) on the threads and between the steel bolt head and the aluminium spherical cap but not on the surface which fits against the alloy wheel. Molub Alloy TA is quite difficult to obtain but is sold by BMW Motorcycle dealers and alternatives are available on Fleabay. Search for "Aluminium anti seize". I considered Stainless Steel replacements but : Wheels, brakes, suspension and steering are all safety critical so decided on refurb. Hope all this is relevant to your situation. And if you are really, really OCD make sure that the tyres are rotated around the rims so that the sidewall lettering is in the same position on all wheels! Copper slip on the threads is ok but not on the seat which I believe is where the friction is achieved to achieve the torque setting. I've done this for 40+ years with out any issues. The handbook says not to put grease on the seat, therefore I assume no risk of any galvanic reaction. Major service .. we use a wire wheel to sand off the rust on the bolt head .. we primer then paint the wheel bolt head . We use ally grease ( silver ) on the threads only .. never get it on the cone . 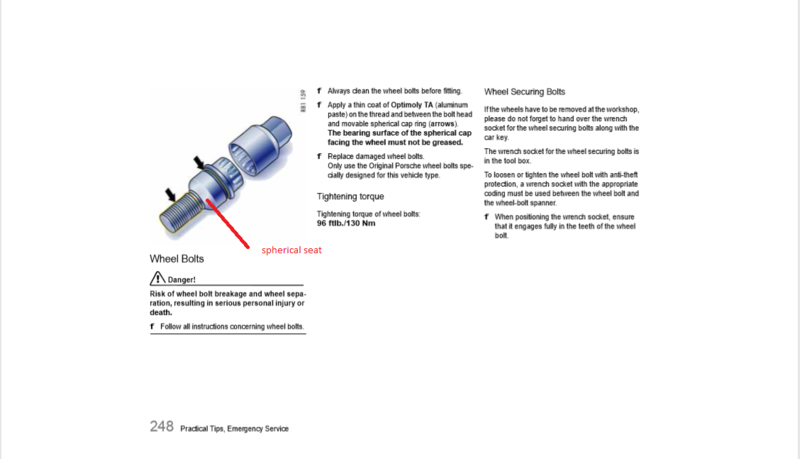 There are x2 colours of wheel bolts .. silver .. the original and you do them up to 100 ft lb... 130 nm. The black ones are the new ones .. from memory they are tightened to 112 ft lb . Silver ones corrode faster than the black ones but in the end they all go rusty . But also to grease the threads hence using ali grease rather than copperslip! Haha, have a look at how geeky we all are! +1 on the titanium bolts. I bought mine last year from a company (Acer Racing) in the USA. No more rust issues. But bolts go into the hub which is steel so should be ok with copper slip, the bolt seat centers the wheel so I don't think the threads touch the actual wheel. The black ones are 160Nm and I recall they eventually said that should also be used on the silver ones.